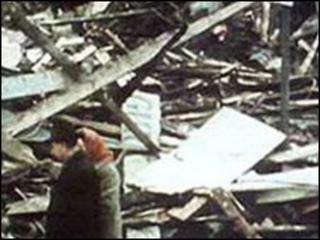 Police Ombudsman Al Hutchinson has withdrawn his report into the 1971 McGurk's bar bomb. Fifteen people died when a UVF bomb exploded at the bar in north Belfast. Some families reacted angrily to some of the report's findings clearing the police of either aiding the attackers or failing to properly investigate it. Mr Hutchinson said he was aware of the criticism and had decided not to publish the report until he heard relatives' concerns "in detail". "I think it's appropriate to acknowledge we didn't deal with the families very well and I need to listen to them personally and hear the specific concerns that they've raised. "So I've decided not to formally publish the report until I've heard their concerns and assessed what they are. "We should have discussed this in more detail. I wish that I had personally done that," Mr Hutchinson said. "I wouldn't say it's an embarrassment, I take it as a learning opportunity - we must do better." Alex McLaughlin, whose father died in the bombing, said he was delighted by the ombudsman's decision. "It's the proper thing to do for the ombudsman to take this report back and have a look at it seriously," he said. "I'm highly delighted that this has happened and they've seen a bit of sense." Sinn Fein's Gerry Kelly said: "The way in which the office of the police ombudsman has conducted this report reflects badly on them. There is now a job to rebuild public confidence in their work. "This needs to start with the production of a report into the McGurk's Bar bombing which gets to the truth and delivers for the families." The ombudsman's office began its investigation after some of the families of those who died made a complaint alleging police did not properly investigate the attack, colluded with those responsible and provided false information to suggest loyalists were not responsible. The bomb was initially blamed on the IRA. The report found there was no evidence police colluded with the loyalist killers and found the allegation that police failed to thoroughly investigate the bombing was not substantiated. Some relatives who had been given copies of the report criticised those findings. Patrick McGurk, whose father, Patrick, was the bar owner, lost his mother, Philomena, who was 46 and his sister, Maria, who was 14 years old, in the bombing. He said the ombudsman's report could not go unchallenged. Mr McGurk described the report's conclusion that "on the balance of probabilities" the police conducted a "reasonably thorough investigation" as "patently ridiculous". He said the facts pointed to the "distinct possibility that the police investigation had not been thorough". "Is it not the case that, if the police jumped to an early conclusion about an IRA home goal, surely then, 'on the balance of probabilities' the police cannot have investigated thoroughly the possiblility that it was a loyalist attack," he said. The ombudsman's report found that the British Army had pushed the idea that the explosion was due to an IRA bomb which had gone off prematurely inside the bar. It found no evidence that police had discussed promoting such an idea, but did say they "let this belief go unchallenged".